Jaundice; Obstructive; Biliary tract neoplasm; Choledocholithiasis; Biliary tract disease. Biliary cystadenoma is a rare tumor of the biliary tree and a rare cause of obstructive jaundice. Most are intrahepatic, and pure extrahepatic biliary cystadenoma is less common. Cases are more common in women. Unless suspected, diagnosis of extrahepatic biliary cystadenoma is often delayed. Here, we report the case of a young woman with extrahepatic biliary cystadenoma who presented at Raja Isteri Pengiran Anak Saleha Hospital with obstructive jaundice initially thought to be due to a large biliary stone based on the endoscopic cholangiogram image. She was successfully managed with resection of the cystadenoma. Biliary obstruction is common in clinical practice and in most instances is due to biliary stones disease.1 In the older population, malignancies also need to be considered. However, it is important that clinicians are aware of the rare causes of biliary obstructions. We report the case of a young woman who presented with obstructive jaundice and was initially treated for a biliary stone that turned out to be biliary cystadenoma, a rare biliary tumor. Figure 1: Cholangiogram showing a large oval shaped filling defect in the proximal common bile duct. Figure 2: Resected specimen showing cystic structures with areas of hemorrhages. Figure 3: (a) Hematoxylin (purple) and eosin (pink/red) stain showing cyst lined with a single layer cuboidal cell consistent of a biliary cystadenoma, 40x magnification. (b) Positive staining for vemintin (brown) showing subepithelial mesenchymal layer of plump spindle shaped cells (ovarian-like stroma), 40x magnification. A 24-year-old woman presented with chronic epigastric and right upper quadrant pain radiating to the back, and jaundice. Her medical history was unremarkable. She had not been taking any medications (including oral contraceptive pills) regularly. Apart from jaundice, physical examination was unremarkable. Laboratory investigations showed cholestatic liver profile with normal white blood cell count and inflammatory marker levels. Ultrasound scan (USS) of the abdomen revealed a dilated common bile duct. Her background history revealed that she was admitted two months prior with similar abdominal pain, but evaluations at that time (liver profiles, upper gastrointestinal endoscopy and USS of the abdomen) had been normal. Her symptoms settled and she was discharged with anti-spasmodic treatment, and reviewed in our patient clinic. 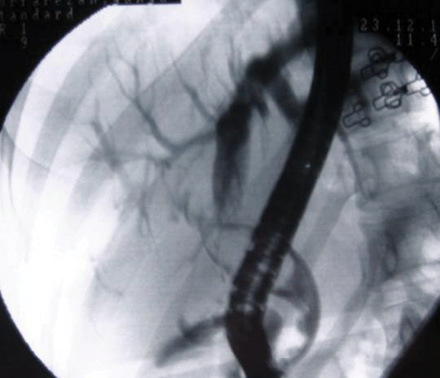 The patient underwent an endoscopic retrograde cholangiography (ERC) which showed a large filling defect [Figure 1] in the common bile duct, consistent with a large biliary stone. After endoscopic sphincterotomy, attempted stone extraction using biliary mechanical lithotripter and balloon failed. The basket failed to capture the stone and the extraction balloon catheter seemed to slip passed the stone whenever it was pulled down. A stent (Cotton-Leung 10Fr 10cm) was placed without any difficulty. Following the procedure, the patient was well without any symptoms. A planned ERC three months later was again unsuccessful and similar difficulties were encountered. A computed tomography (CT) scan showed the filling defect to be cystic in nature. There were no other abnormalities such as hepatic cysts away or within the vicinity of the biliary cystic lesion to suggest any communication or connection seen on the imaging. There were no other cystic lesions seen in other organs including the pancreas. The patient proceeded to surgery. A biliary polyp (3.5cm by 1.8cm) attached to the bifurcation of the bile duct was identified. Resection and Roux-en-Y hepaticojejunostomy was performed without any complication. On dissection, the polyp [Figure 2] was biloculated with cysts measuring 1.5cm and 0.5cm, respectively. Histology revealed the cysts to be lined with cuboidal to low columnar cells, a subepithelial mesenchymal layer of plump spindle shaped cells (ovarian-like stroma), uniform nuclei, and an outer wall formed of hyalinized fibrous connective tissue [Figure 3a]. Stain for vimentin was positive [Figure 3b]. There was no evidence of malignant transformation. The final diagnosis was biliary obstruction secondary to a biliary cystadenoma. The patient remained well without any symptoms almost three years after resection and there was no evidence of recurrence on follow-up imaging. The patient was also advised to avoid using oral contraceptive pills. Biliary adenoma or biliary cystadenoma is a rare cystic neoplasm and a rare cause of biliary obstruction.2-6 It accounts for less than 5% of nonparasitic hepatic cystic lesions. It was first described in 1943 and, to date, less than 200 cases have been reported.2 It is a slowly growing benign tumor that has malignant potential, especially those with mesenchymal ovarian struma.7,8 It is more common in middle aged women (85–95%), with a gender ratio of 4:1. Our patient was much younger than those reported in the literature. Commonly reported symptoms include vague abdominal pain (up to 90%) and nonspecific mass symptoms (>30%).4,10 Dyspepsia, anorexia, vomiting, and weight loss are less common.11 These symptoms are nonspecific and resemble other cause of obstructive jaundice. Given the nonspecific nature of the symptoms, patients often have symptoms that have been present for a long time. The diagnosis of biliary cystadenoma require a high level of suspicion. Generally, the diagnosis of extrahepatic biliary cystadenoma is not made preoperatively. Characteristic features on magnetic resonance imaging (MRI) have been reported that allowed preoperative diagnosis of cystadenoma with ovarian stroma.12 Presence of intramural nodule or irregular wall is suggestive of malignant transformation. In a setting where biliary stones are common, finding by USS and ERC imaging often resemble stones and in the present case, our patient was managed as such. CT imaging in our patient revealed the lesion to be cystic in nature, and this prompted a decision to refer the patient for surgery. In the intrahepatic variant, involvements of the extrahepatic biliary tree are through compression by the cyst, or rarely prolapse of part of the cyst, into the biliary system causing obstruction. Complete resection is advised as there is risk of malignant transformation.7,13 Furthermore, recurrence is possible and is often related to incomplete resection of the lesion even in the absence of malignant transformation. In our case, only the cystic adenoma was resected and our surgeon did not consider any extensive resection, such as a sleeve resection, as there was no lesion outside of the biliary tree seen on imaging and during surgery. Our patient remained under surveillance and to date, after more than three years, there has been no evidence of recurrence of the lesion. She was also advised to avoid using any contraceptive pill since it remains unknown whether these increase the risk of recurrence of the cystadenoma. This report documents a rare case of intraluminal biliary cystadenoma that presented with obstructive jaundice, and that resembled a biliary stone. The diagnosis was not made until the patient went for surgery. Clinicians, especially those involved with endoscopy, should be aware of this entity as there is malignant potential. The authors declared no conflict of interest. No funding was received for this work. Beckingham IJ, Ryder SD. ABC of diseases of liver, pancreas, and biliary system. Investigation of liver and biliary disease. BMJ 2001 Jan;322(7277):33-36. Ahanatha Pillai S, Velayutham V, Perumal S, Ulagendra Perumal S, Lakshmanan A, Ramaswami S, Ramasamy R, Sathyanesan J, Palaniappan R, Rajagopal S. Biliary cystadenomas: a case for complete resection. HPB Surg. 2012;2012:501705. Soochan D, Keough V, Wanless I, Molinari M. Intra and extra-hepatic cystadenoma of the biliary duct. Review of literature and radiological and pathological characteristics of a very rare case. BMJ Case Rep 2012;2012:2012. Hernandez Bartolome MA, Fuerte Ruiz S, Manzanedo Romero I, Ramos Lojo B, Rodriguez Prieto I, Gimenez Alvira L, et al. Biliary cystadenoma. World J Gastroenterol 2009 Jul;15(28):3573-3575. Rayapudi K, Schmitt T, Olyaee M. Filling Defect on ERCP: Biliary Cystadenoma, a Rare Tumor. Case Rep Gastroenterol 2013 Jan;7(1):7-13. Gonzalez M, Majno P, Terraz S, Morel P, Rubbia-Brandt L, Mentha G. Biliary cystadenoma revealed by obstructive jaundice. Dig Liver Dis 2009 Jul;41(7):e11-e13. Wheeler DA, Edmondson HA. Cystadenoma with mesenchymal stroma (CMS) in the liver and bile ducts. A clinicopathologic study of 17 cases, 4 with malignant change. Cancer 1985 Sep;56(6):1434-1445. Hennessey DB, Traynor O. Extrahepatic biliary cystadenoma with mesenchymal stroma: a true biliary cystadenoma? A case report. J Gastrointestin Liver Dis 2011 Jun;20(2):209-211. Del Poggio P, Buonocore M. Cystic tumors of the liver: a practical approach. World J Gastroenterol 2008 Jun;14(23):3616-3620. Wang C, Miao R, Liu H, Du X, Liu L, Lu X, et al. Intrahepatic biliary cystadenoma and cystadenocarcinoma: an experience of 30 cases. Dig Liver Dis 2012 May;44(5):426-431. Florman SS, Slakey DP. 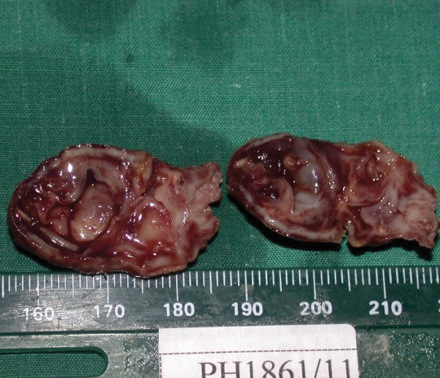 Giant biliary cystadenoma: case report and literature review. Am Surg 2001 Aug;67(8):727-732. Nakagawa M, Matsuda M, Masaji H, Goro W. Successful preoperative diagnosis of biliary cystadenoma with mesenchymal stroma and its characteristic imaging features: report of two cases. Turk J Gastroenterol 2011 Dec;22(6):631-635. Thomas KT, Welch D, Trueblood A, Sulur P, Wise P, Gorden DL, et al. Effective treatment of biliary cystadenoma. Ann Surg 2005 May;241(5):769-773, discussion 773-775.